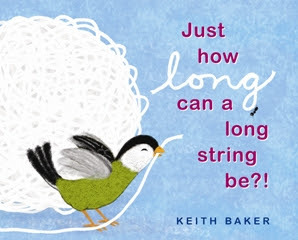 This book, by Keith Baker, was the inspiration for this lesson on length. I started the lesson by having students recall what we had done previously during the play-doh snake lesson, what length meant, what a baseline was, and how we compare the length of objects. Then we read the book Just How Long Can a Long String Be?! As a whole group, we compared the length of string attached to a variety of objects to the length of string attached to a balloon. Students took turns coming to the middle of the mat to compare strings on objects to the balloon string and to determine if the string was shorter than, longer than, or the same as the balloon string. I used this time to make sure students had a clear understanding of how to compare the length of objects (using the same baseline for both strings when measuring, laying the strings side by side to compare them, and pulling the strings out straight). I also had them repeat each time what length meant, what a baseline was, which was longer, which was shorter, how they knew, etc. We sorted the stringed objects as we went. After the whole group activity and model, I had students work in small groups to compare the length of pieces of colored string. Students worked in small groups for this activity. The black piece of string was the piece they used for making comparisons to each time. They compared it to all of the other pieces of colored string to see if the colored string was shorter than, longer than, or the same as the black string. Then they sorted the string onto mats. While the students compared and sorted their string, I walked around and had conversations with them having them explain to me what they were doing and why. Materials for this lesson- I purchased all of the objects for the whole group sort from the dollar store. I had several items I did not get to like a kite, a gift bag, shoe lace, musical instrument, etc. I walked all over the dollar store looking for any items they had with string. I cut the strings of yarn myself making sure some of the pieces would be longer than, some would be shorter than, and some would be the same as.